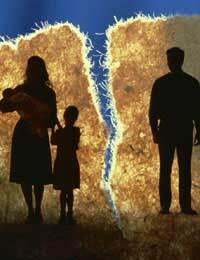 The Family Law Act was introduced in order to revolutionise the divorce process in this country. Amongst other things, it tried to abolish the notion of ‘fault’ based divorces, which are brought on grounds such as unreasonable behaviour and adultery in order to rush a divorce through the courts. This part of the Act was scrapped by the Government in 2001, when it was decided that this would make divorce too easy for couples experiencing marital difficulties. The law also promoted the use of mediation in divorce, in order to reduce the number of cases that ended up in the family court rather than being settled between the parties. One of the most significant elements of this act relates to Part 4 of the Act. There are two ‘Orders’ that were created to assist people having difficulties in their relationships. These are the ‘Non-Molestation Order’, which stops another person from harming you or a child in your family, and the ‘Occupation Order’, which determines who should remain in the family home, and who should leave. There are limitations on the people against whom you can take out these types of order. You can use them against your spouse, your partner with whom you have cohabited (with some exceptions), a relative, your fiancé (but you will need to provide some proof that you are engaged, such as a ring, or testimony from someone who came to your engagement party), or the other parent of your child. A person under the age of 18 can apply for a non-molestation order, but will need an adult to help them (called a ‘next friend’). Anyone under the age of 16 will need the permission of a high court judge in order to apply for an order. You can apply for an order at any county court that has the ability to hear divorce or family proceedings. You can also use a magistrates court, if they have the power to hear family cases. You may need to pay a fee to make your application, but if you are receiving certain benefits this may be waived. If you are applying for an Occupation order, it would be helpful if you had a mortgage agreement or tenancy agreement. You will need three copies of form FL401, or four copies if you are applying for an Occupation Order. Then, on form N285 you will need to set out the why you need the order and what has happened to make you want to take out this order. If you think that your means are too low so that you should be entitled to be exempt from the fee, you will need to use form EX160. Once you have filled these in, you should take them to the court with the fee and the appropriate evidence. For example, if you are in receipt of Income Support you should provide evidence so that you do not have to pay a court fee. The court will ensure that the forms are filled out correctly and then give you a form FL402, or notice of proceedings. This form will tell you when your appointment with the judge is. You will then need to serve notice of the proceedings on the other party personally (i.e. they must be actually handed the document), and may wish to ask the court or a bailiff to do this on your behalf. make an order that continues until you or the other person ask the judge to reconsider it. If a child goes to live with the father paying child support, can he stop paying child support to the mother who no longer has the child following the child being moved by social services? @samson - you may find some information in our partner article The Different Types of Contact Orders, link here. I hope this helps. where can I get a clear legal definition to the following supervised contact supported contact and also a term im seeing a lot used by courts in parenting orders supervised/supported contact where friends and family members act as supervisors.